In this year [5920 or 421 AD], following the example of the blessed Pulcheria, the devout Theodosius [II] sent much money to the bishop of Jerusalem [Juvenal] for distribution to those in need and a golden cross set with stones to be erected at the Place of the Skull. In return, the archbishop sent the relic of the right hand of Stephen the Protomartyr by the holy Passarion. When he came to Chalcedon, that night the blessed Pulcheria saw Saint Stephen in a dream saying to her: "Behold, your prayer has been heard, your request granted, and I am come to Chalcedon." Taking her brother with her, she rose up and went to meet the holy relic. She received them into the palace and built a glorious house in honor of the holy Protomartyr in which she deposited the holy relic. Thus, the translation of the relic of the right hand of St. Stephen from Jerusalem to Constantinople in 421 is the earliest historically attested translation of any relic of St. Stephen to Constantinople, though it has no commemoration in the liturgical calendar of the Church such as when a major portion of the relics of St. Stephen were translated in 439 and is commemorated on August 2nd. Theophanes, though writing centuries later, is the earliest historical record of this translation in 421. As for the chapel built by Pulcheria in the palace in honor of St. Stephen, it was built in the wing known as the Palace of Daphne. 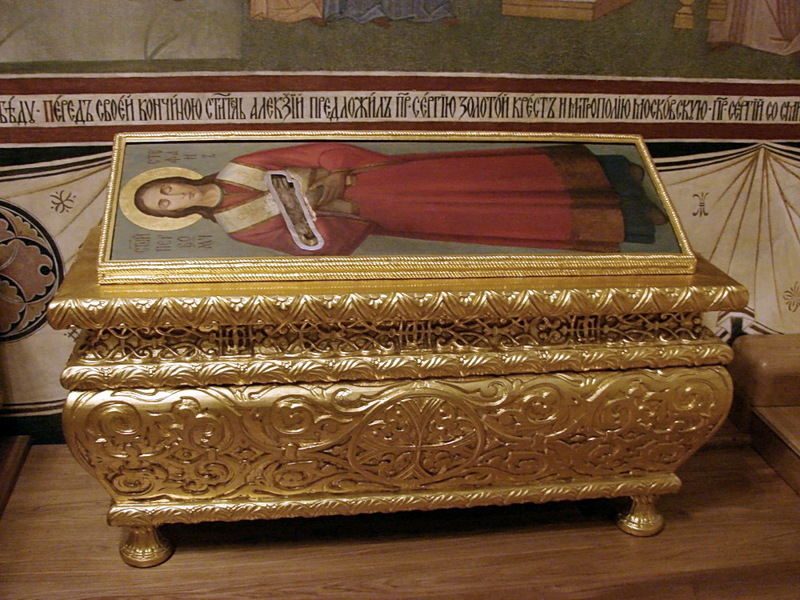 In the 420's Empress Pulcheria played a pivotal role in welcoming relics to the imperial capital. Often their arrival was welcomed with her building a church in honor of the Saint or Saints whose relics were brought. When war was threatening to break out against Persia, Emperor Theodosius the Younger, in imitation of his sister Pulcheria, sought divine aid in the campaign by sending a great deal of money to the poor of Jerusalem and a large golden cross encrusted with precious stones to be placed on Golgotha. 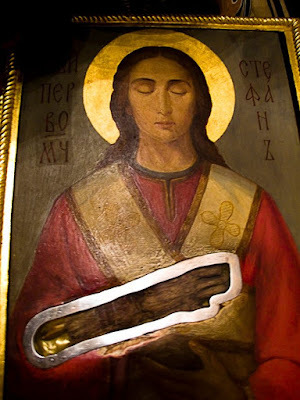 In thanks and in exchange for these gifts, Patriarch Juvenal of Jerusalem sent as a gift to Constantinople the right hand of St. Stephen by means of Archimandrite Passarion. When the relic of St. Stephen arrived in Constantinople with a great ceremony, and accepted by Theodosius and Pulcheria, it is believed that this boosted morale for the campaign against the Persians and that through the intercessions of the Saint victory would be assured. 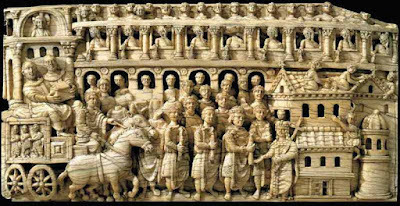 The Trier Ivory, known as the "Translation of Relics", contained in the treasury of Trier Cathedral in Germany, shows a fifth century imperial procession focused on the augusta Pulcheria, translating the relic of St. Stephen to his chapel in Daphne. 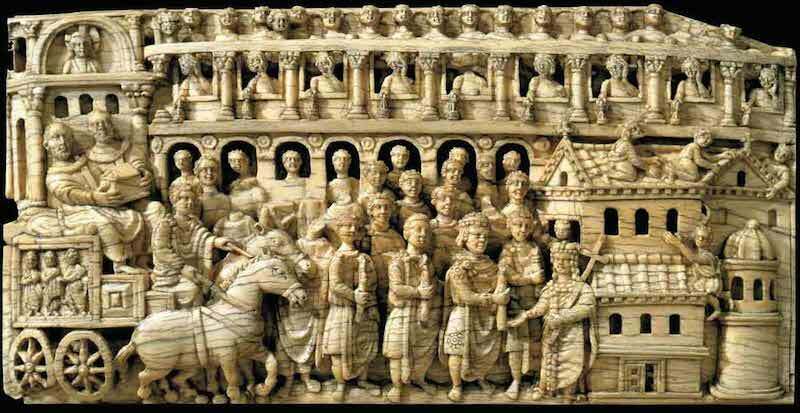 The ivory most likely dates to the eighth century. 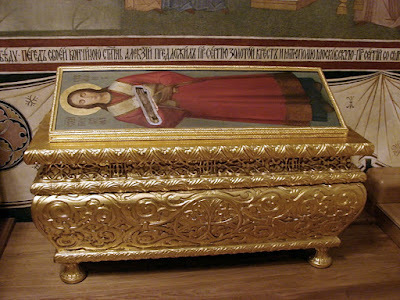 Currently the right hand (arm to elbow) of St. Stephen is kept in reliquary at Trinity-St. Sergius Lavra, in the town of Sergiyev Posad, about 70 km to the northeast from Moscow.